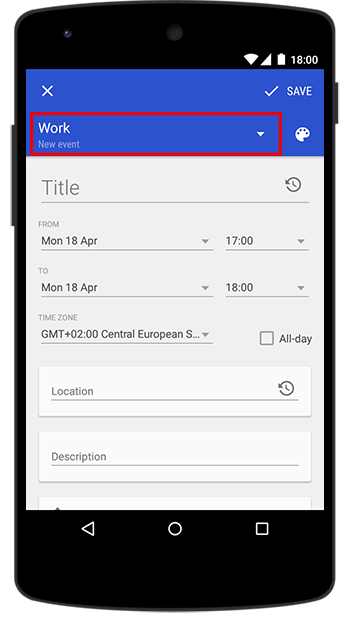 The pro version of the app offers you the possibility to use and manage templates. 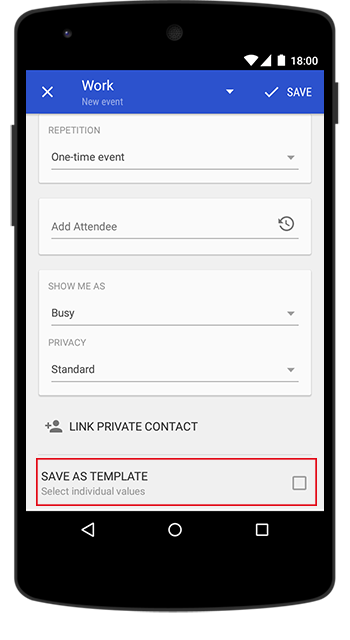 With a created template, you can easily insert all event and task details, without the necessity to manually type everything. A template can be used to save time, if you plan to create appointments with similar or the same properties. You can also create templates for your tasks, which you don’t feel like creating over and over again. 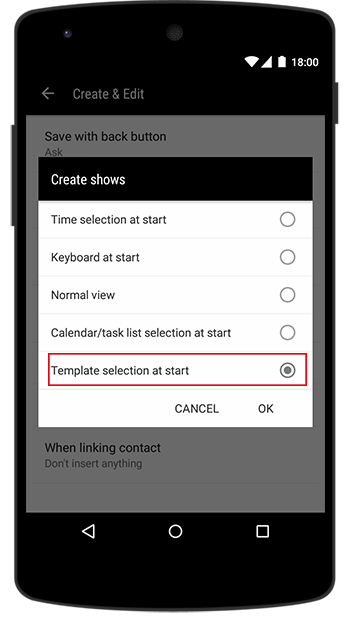 When adding a new event or task you can choose to save it as template. You can choose which fields will be included in the template. 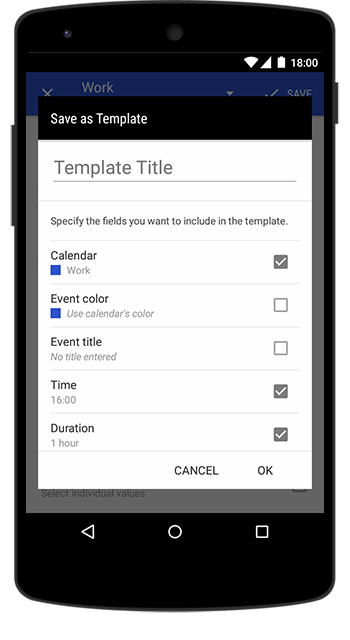 After saving the template options, you can choose between → Save event/task and template and → Save only as template. 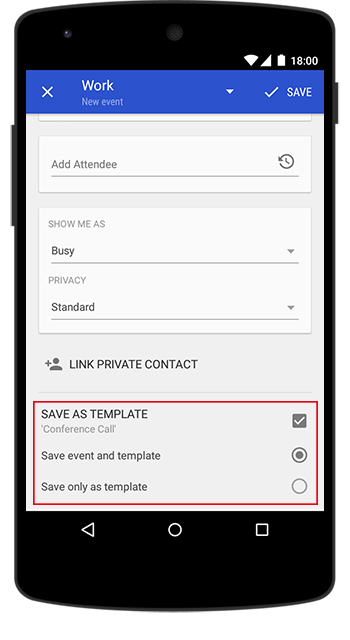 Having done that, you save the template (→ Save button for the event/task) and you can use it for every newly created event/task. To use a previously created template you need to click on the calendar name in the event creation view. Then click on the template tab and select the template you want to use from the list. If you want to edit a template, you open the template list as described above ­and click on the pencil icon. You can either remove fields from the template by clicking on the checkbox icon or edit the information by clicking on the header of a field. In order to delete a template, you simply use the recycle bin icon provided next to your template’s name in the template list. In order to quickly set up a template per default, you just need to long press it in the template list. The information will now always be inserted in the new event draft. Long press the template again to remove the setting. If you, however, want that the template selection to appear immediately when creating a new event/task, just go to → Settings ­→ Create & Edit ­→ Create shows ­and choose → Template selection at start. With the import/export settings feature, you can not only back up your app settings. This feature also includes your templates. To back up your templates, please go to → Settings → Maintenance and choose the option → Export settings. If you want to back up the templates exclusively, uncheck all other options and export the data. On new or reset devices, you can simply import the file with your templates.